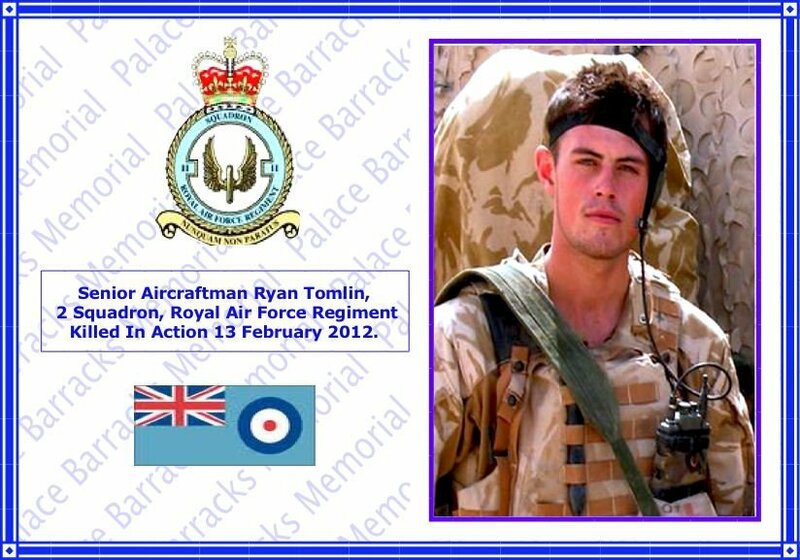 Senior Aircraftman Ryan Tomlin, 2 Squadron Royal Air Force Regiment, killed in Afghanistan on Monday 13 February 2012. Senior Aircraftman Tomlin was taking part in a partnered patrol to reassure and interact with the local population in the western Dashte area on the edge of Nad ‘Ali district in central Helmand province when he was fatally wounded by small arms fire from an insurgent attack. He was evacuated by air to the field hospital at Camp Bastion where sadly he succumbed to his wounds. Senior Aircraftman Ryan Tomlin, aged 21, from Hemel Hempstead, was born on 29 May 1990. He joined the Royal Air Force in October 2008, completing his Trainee Gunners Course in April 2009 before moving on to the Phase One Field Gunners Course. He was selected to join 2 Squadron Royal Air Force Regiment, based at RAF Honington, in June 2009. He arrived at an incredibly busy time for the squadron and launched straight into Afghanistan pre-deployment training. Senior Aircraftman Tomlin completed his first tour in Afghanistan in 2010 as a specialist driver on a Rifle Flight (the RAF Regiment equivalent of a platoon), defending Kandahar Airfield. After returning from this successful deployment, he showed promise and the desire to develop new skills. He deployed on a second tour to Afghanistan with No 3 RAF Force Protection Wing at Camp Bastion in October 2011. From the start of the tour, he and his section supported squadron operations out on the ground around Bastion with great skill and determination, often deploying for several days at a time through the harsh Helmand winter. A highly professional and skilful gunner who achieved all he set out to do in his three years in the Royal Air Force Regiment, Senior Aircraftman Tomlin became one of the rising stars of his squadron and regiment, and showed great potential for what promised to be the brightest of futures. He leaves behind his mother and father, Diane and Kevin, and a sister, Michelle. The thoughts of all in 2 Squadron and No 3 RAF Force Protection Wing are with them at this most difficult of times. Wing Commander Jason Sutton, Commanding Officer, No 3 RAF Force Protection Wing, said: “Senior Aircraftman Tomlin was one of the finest men on my wing and his loss has come as a terrible blow to all of us, especially his comrades on his beloved 2 Squadron Royal Air Force Regiment. Bright, gifted and an absolute master of his craft, he had the complete trust of those who had the privilege of serving alongside him. “When the task was hard, he would immediately rise to the challenge. When those around him were weary, he was the one to lift their spirits, and, when the enemy threatened, he was the first to be ready to fight. In our grief, we take comfort that he fell doing the job he loved, protecting his mates and the Afghan National Army soldiers we work to support in our shared task of building a better future for Afghanistan. 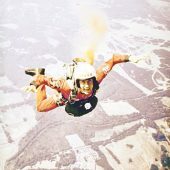 “Senior Aircraftman Tomlin enjoyed banter within his close-knit section, always remaining upbeat and lifting the spirits of those around him. Already an experienced gunner with a tour in Afghanistan to his name, on this tour his confidence grew quickly in just a few short months. “He was depended upon time and again to provide vital surveillance and reconnaissance and long range fire support to his colleagues when needed. Indeed, I witnessed at first hand his quick thinking and calm professional manner during a meeting with village elders when he and his colleagues successfully fought off an insurgent attack. “Senior Aircraftman Tomlin was fatally wounded whilst on an important engagement patrol, reassuring villagers and improving the lives of local Afghan people. He loved his job, he was a pleasure to command, and I am honoured to have known him. Corporal Thomas Vardy, Section Commander, 2 Squadron Royal Air Force Regiment, No 3 RAF Force Protection Wing, said: I first met Ryan when I was posted to 2 Squadron in October 2009. I know it’s not fair to have favourites, but I took an instant liking to Ryan. He was young, enthusiastic, funny, and had knowledge beyond his years. I had the privilege not only of having Ryan on the same flight, but on my section. He was my driver for six months on his first tour of Afghanistan in early 2010. I particularly remember haranguing him on his birthday because it was 10 o’clock in the morning and he still had his night-sight on his weapon. “Ryan was very keen and a good soldier. He was a constant source of morale and nothing got him down. I’m certain he would have had a very successful career. Senior Aircraftman Robert Zuccolini, Signaller, 2 Squadron Royal Air Force Regiment, No 3 RAF Force Protection Wing, said: “Ryan Tomlin always had morale to give out. You would never find him in a bad mood and he would never put you in one. I had the privilege and honour to go through basic training with him. Ryan was always someone who could get you through the tough times. He was a ‘Rock Ape’ through and through and passed out with his regimental brothers with pride. “After spending a few months in 2 Squadron doing driver training and getting to grips with squadron life, we all went into pre-deployment training getting ready for Kandahar. It was new to us all but no-one seemed worried, especially Ryan. He couldn’t wait for the operational bonus at the end! During the tour, Ryan proved himself to be an outstanding soldier and a true friend. A highly professional and skilful gunner who achieved all he set out to do in his three years in the Royal Air Force Regiment, Senior Aircraftman Tomlin became one of the rising stars of his squadron and regiment, and showed great potential for what promised to be the brightest of futures. He leaves behind his mother and father, Diane and Kevin, and a sister, Michelle. The thoughts of all in 2 Squadron and No 3 RAF Force Protection Wing are with them at this most difficult of times. “Senior Aircraftman Tomlin was one of the finest men on my wing and his loss has come as a terrible blow to all of us, especially his comrades on his beloved 2 Squadron Royal Air Force Regiment. Bright, gifted and an absolute master of his craft, he had the complete trust of those who had the privilege of serving alongside him. “Senior Aircraftman Tomlin had the brightest future ahead of him, and his loss has deprived the Royal Air Force Regiment of one of its very best. In continuing our mission here to protect air operations and the people who work at Camp Bastion, we will strive to do justice to the fine example he set. “Professional, experienced and extremely popular, Senior Aircraftman Tomlin was one of the best gunners in 2 Squadron. He excelled at everything he did and he epitomised the Royal Air Force Regiment spirit in every way. “He was hugely respected by his peers and he frequently mentored the younger members of the squadron. Joining the squadron in 2009, Senior Aircraftman Tomlin soon proved to be an exceptional marksman, displaying an excellent flair for fieldcraft. “I first met Ryan when I was posted to 2 Squadron in October 2009. I know it’s not fair to have favourites, but I took an instant liking to Ryan. He was young, enthusiastic, funny, and had knowledge beyond his years. “I had the privilege not only of having Ryan on the same flight, but on my section. He was my driver for six months on his first tour of Afghanistan in early 2010. I particularly remember haranguing him on his birthday because it was 10 o’clock in the morning and he still had his night-sight on his weapon. “Ryan was very keen and a good soldier. He was a constant source of morale and nothing got him down. I’m certain he would have had a very successful career. “It was clear that Ryan was very close to his family and friends as he made every effort to go back home to Hemel Hempstead at weekends. My thoughts and prayers are with his family and friends and they should be extremely proud of him. “It’s hard to put into words how much you are going to miss someone. Ryan wasn’t just one of my team, he was my friend. Nobody had a bad word to say about him and it was difficult to put him down. If you were having a photo, he would be in the background messing around. When he got excited the decibels went up and he talked too fast, but that was just Ryan. “Ryan Tomlin always had morale to give out. You would never find him in a bad mood and he would never put you in one. I had the privilege and honour to go through basic training with him. Ryan was always someone who could get you through the tough times. He was a ‘Rock Ape’ through and through and passed out with his regimental brothers with pride. “After spending a few months in 2 Squadron doing driver training and getting to grips with squadron life, we all went into pre-deployment training getting ready for Kandahar. It was new to us all but no-one seemed worried, especially Ryan. He couldn’t wait for the operational bonus at the end! During the tour, Ryan proved himself to be an outstanding soldier and a true friend.